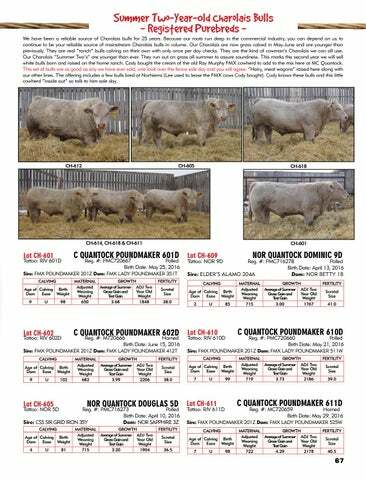 Summer Two-Year-Old Charolais Bulls - Registered Purebreds We have been a reliable source of Charolais bulls for 25 years. Because our roots run deep in the commercial industry, you can depend on us to continue to be your reliable source of mainstream Charolais bulls in volume. Our Charolais are now grass calved in May-June and are younger than previously. They are real “ranch” bulls calving on their own with only once per day checks. They are the kind of cowman’s Charolais we can all use. Our Charolais “Summer Two’s” are younger than ever. They run out on grass all summer to assure soundness. This marks the second year we will sell white bulls born and raised on the home ranch. Cody bought the cream of the old Ray Murphy FMX cowherd to add to the mix here at MC Quantock. This set of bulls are as good as any we have ever sold, one look over the fence sale day and you will agree. “Hairy, meat wagons” raised here along with our other lines. The offering includes a few bulls bred at Norhiems (Lee used to lease the FMX cows Cody bought). Cody knows these bulls and this little cowherd “inside out” so talk to him sale day.